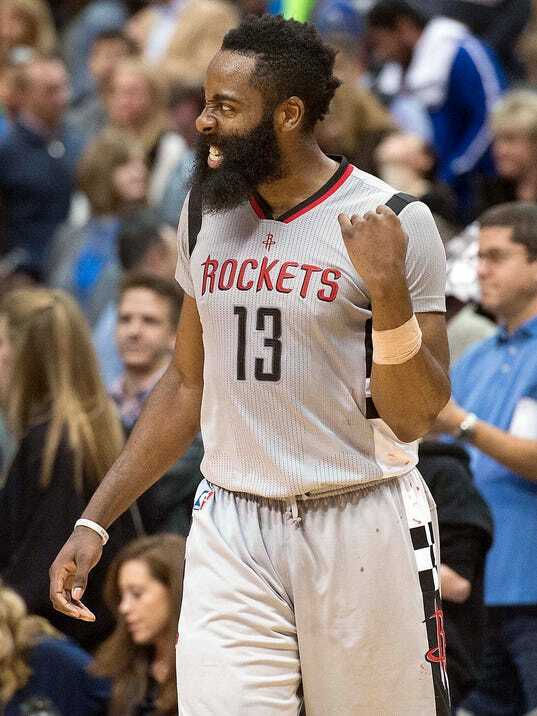 DALLAS (AP) — James Harden was off to another rough shooting start against Dallas and not getting to his usual spot at the free throw line either, so Houston stayed in the game with 3-pointers. With the score tied in the final minutes, the Rockets went to their All-Star guard — of course. Harden had an assist for an easy go-ahead dunk by Terrence Jones and scored the last of his 25 points on a clinching jumper that bounced on the rim several times in the Rockets’ 100-96 victory over the Mavericks on Friday night. First, Harden found Jones under the basket for a wide-open dunk to break a 96-all tie. Harden had nine assists and eight rebounds as the NBA’s free throw leader found a way to make a difference despite not getting to the line until the third quarter and going 4-of-5 from there.